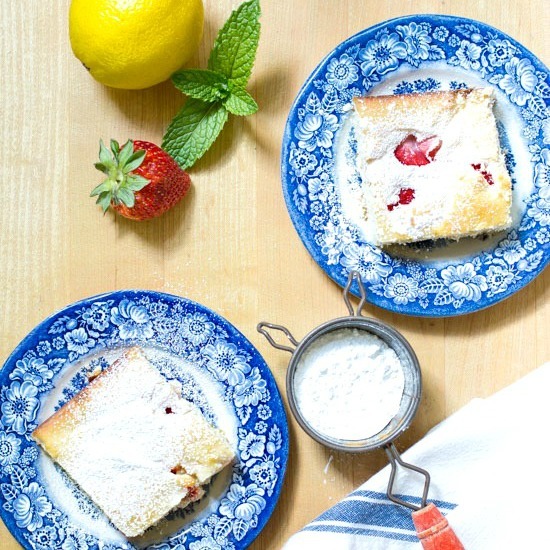 Strawberry Lemon Shortbread Bars: a quick and easy dessert that gets its incredible taste from fresh lemon and strawberries. The perfect shortbread recipe. 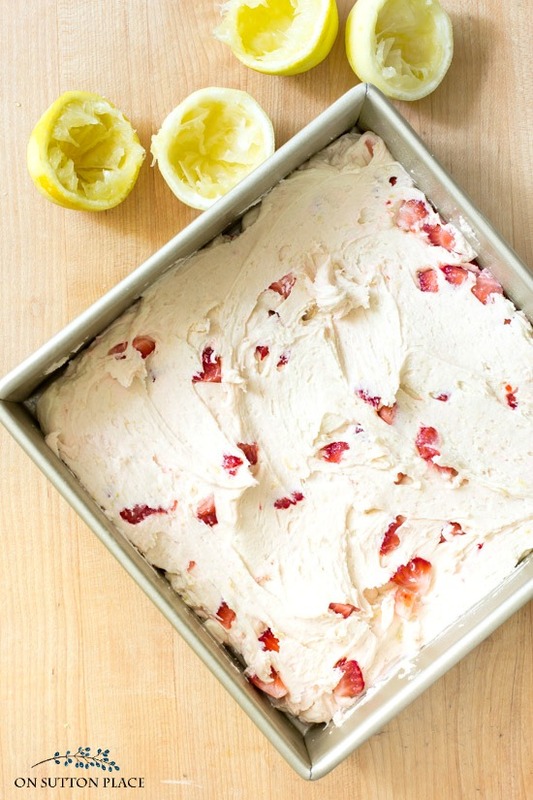 This recipe for strawberry lemon shortbread bars has fresh lemon peel AND juice which makes the taste fresh and bright. 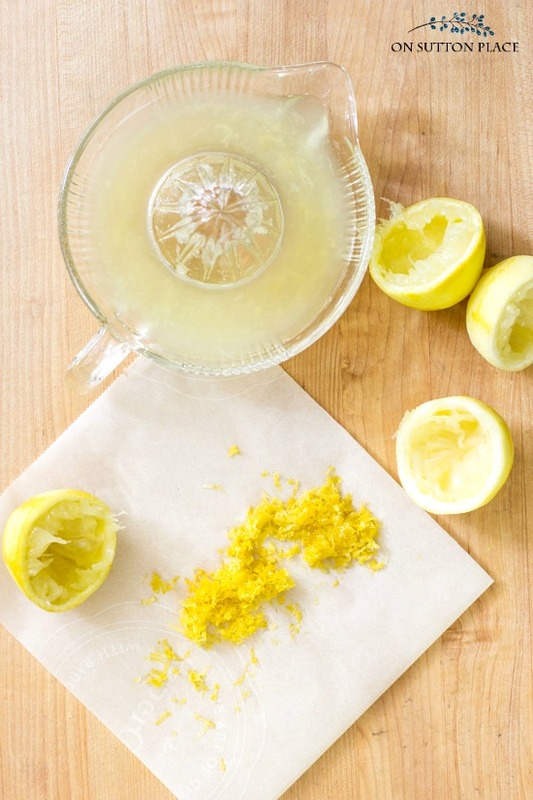 I love recipes that call for lemon peel because one of my favorite things to do is zest a lemon. The scent is like no other. When it’s all mixed together, the batter is a bit stiff, but I didn’t have any trouble spreading it out to the sides of the pan. I used a 9 x 9 baking pan but if you don’t have one, just use an 8 x 8. It may take a few minutes longer to bake so just watch it towards the end. Slowly add dry mixture to batter just until combined. Put dough into prepared 9 x 9 pan and spread to the edges with a large spoon. Bake 35 - 40 min. until golden on top and knife inserted in center comes out clean. I prepare my pans with Baker's Joy. 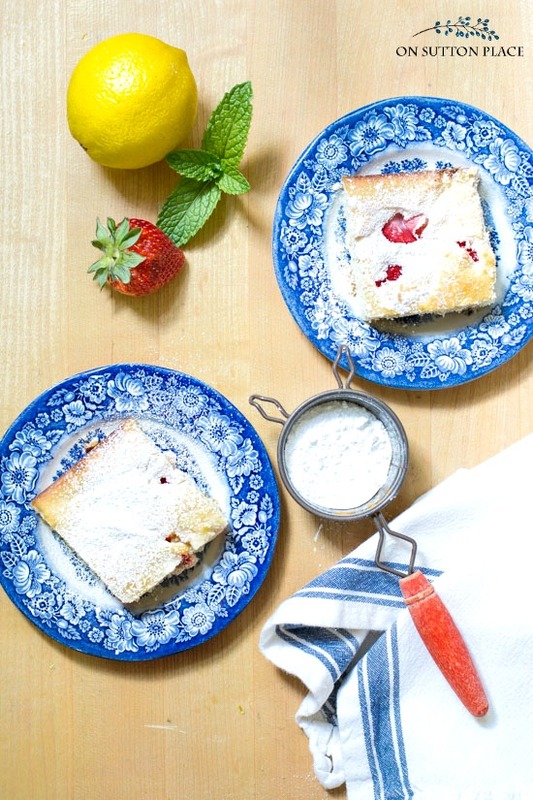 This would be a lovely dessert to serve for a summer brunch or family dinner. I think it’s very pretty and if you garnished it with a sliced strawberry (or a slice of lemon) and a mint leaf it would definitely impress your guests! I also think you could substitute other fruits for the strawberries. Blueberries would be especially delicious. Wishing you all a safe and restful Memorial Day weekend. These look perfect, Ann! I can’t wait to make them, though I’ll be using blueberries or boysenberries, since that’s what I’m harvesting now. Our strawberries didn’t bounce back from being a mole playground last fall. :( I think they’ll be good anyway – and so easy. Thanks! 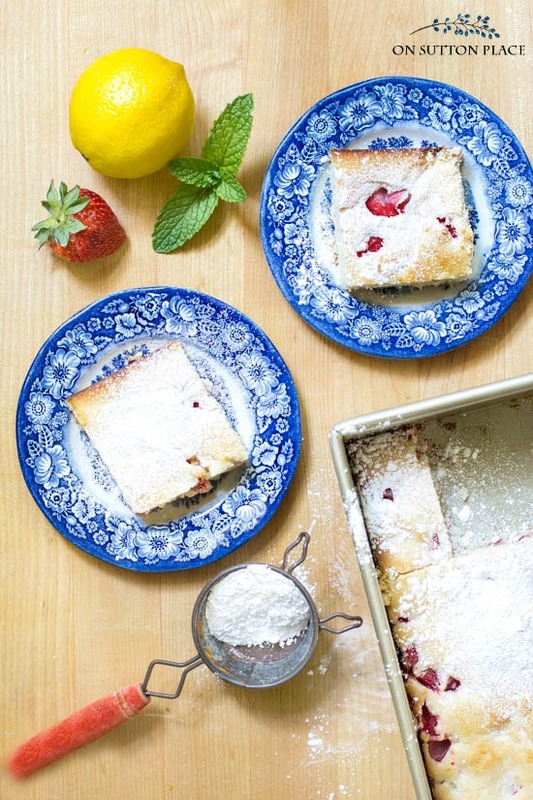 Hi Ann ~ The strawberry lemon bars look delicious!! Love the combo of two favorites together. Before I whip up a batch for my family, I want to double check the recipe. In your narrative, you mention that 2 sticks of butter add to the shortbread texture and yet the recipe calls for 1 stick of butter. Is it 1 or 2 sticks of butter? Thank you. I’m always happy to read your posts and see what creative goodness you’re sharing! Than you for sharing this recipe. Since strawberries are abundant it makes for the perfect recipe for picnics, family gatherings,and church socials. I love lemon also and it just really gives a crisp and refreshing feel to any dish. I can;t wait to give it a try. Those look delicious! 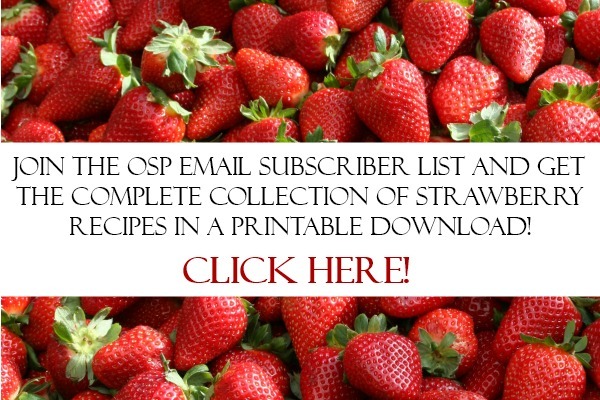 I love anything with strawberries and can’t wait to give these a try. Enjoy your week. Thank you for all your wonderful recipes and craft ideas. I am an 80 year old fan of yours. My dad spent thirty years in the Army…he arrived home from the Korean war on the day of my high school graduation in June 1953. My husband spent thirty years as a Naval officer with many many deployments…including three nine-month separations the first three years of our marriage plus a year of duty in Viet Nam. Our son was a Navy pilot in Desert Storm. So I have experienced all the sacrifices you mentioned…though I have never thought of them as sacrifices. Instead, I believe I have been blessed throughout my life to have received the love and kindness of men who are brave, caring and honorable. I am so proud of all of them and am especially proud to be an American! Your comments echo my feelings perfectly. So grateful for the many who have and are serving in the armed forces. My father-in-law was awarded the Purple Heart for injuries sustained on D Day. He lived to be 93 and always enjoyed sharing details of that day with his family. Your recipe is yummy!! Just took mine out of the oven a few minutes ago and had to taste it immediately. The lemon flavor is delicious. The texture of mine is like a finely textured cake, not a shortbread at all. Sooooo good! Are those ‘Liberty Blue’ plates I spy?! I have all the ingredients on hand. I’m hoping I can make this tonight to serve to guests (former military) tomorrow. My husband served in the Army, but not during war time. My mother’s two brothers served on Destroyers in WWII. Just buried one 86yr old Uncle. His step-daughter received the Flag from a Marine. She walked the folded Flag over and gave it to my uncle’s brother that had served on the other Destroyer. I thought that was a truly unselfish kind thing to do. You should have seen him hugging that Flag. Thank you for remembering our service men and women. My son was in Desert Storm and Desert Shield. Many nights sitting up. Hope you are having good Memorial Day. That was very thoughtful of you Ann to say about those men & women that serve/or have served. I’m so grateful that that part of my life is over, as it is very scary. Almost every man in our family has served in the military, but thankfully not my boys. Have a wonderful Memorial Day with your family! My father is a World War II veteran, he will be 93 in a few weeks! We are proud of his service! My father too is a WWII veteran and he will be 95 on August 1.He was in the Army. His assisted living is having a Navy Seal speak tomorrow and present all the veterans a gift. Bringing my camera. Happy Memorial Day weekend to you. . . I think this was your best posting. Sincere, to the point, heartfelt, patriotic. Timely, tasty recipe. Will be trying tomorrow. You are the best Ann. Keep on sharing.